If your trying to keep your calories down and still have all the flavor, this recipe is perfect for you! 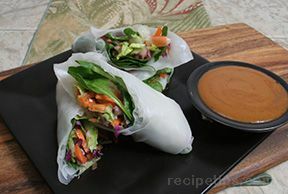 Soak individual spring roll wrappers in warm water until wrapper becomes soft and pliable; approximately 2 minutes. Combine lettuce, cabbage, carrots, scallions, pepper and balsamic vinaigrette in bowl: toss to mix evenly. Remove spring roll from the warm water and place on paper towel to drain excess water. Place spinach leaves on wrapper, then top with the salad mixture. Layer sliced shrimp pieces on top of that. Roll one end of wrapper over the lettuce mixture, pull sides up and fold over the long way, continue rolling spring roll, finishing with seam side down on the paper towel. Cut spring roll in half at an angle, lengthwise. Serve with Thia Peanut Sauce. Optional: Add a few mint leaves to the roll for more flavor. Replace the shrimp with cooked chicken or pork for non seafood lovers.